The book Free Movement of Civil Judgments in the European Union and the Right to a Fair Trial (T.M.C. Asser Press/Springer, 2017), authored by Monique Hazelhorst, has just been published. It is the commercial edition of a PhD thesis succesfully defended at Erasmus School of Law (Rotterdam). 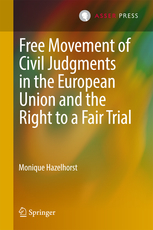 This book examines the attainment of complete free movement of civil judgments across EU member states from the perspective of its conformity with the fundamental right to a fair trial. In the integrated legal order of the European Union, it is essential that litigants can rely on a judgment no matter where in the EU it was delivered. Effective mechanisms for cross-border recognition and the enforcement of judgments provide both debtors and creditors with the security that their rights, including their right to a fair trial, will be protected. In recent years the attainment of complete free movement of civil judgments, through simplification or abolition of these mechanisms, has become a priority for the European legislator. The text uniquely combines a thorough discussion of EU legislation with an in-depth and critical examination of its interplay with fundamental rights. It contains an overview and comparison of both ECtHR and CJEU case law on the right to a fair trial, and provides a great number of specific recommendations for current and future legislation. With its critical discussion of EU Regulations from both a practical and a theoretical standpoint, this book is particularly relevant to legislators and policymakers working in this field. Because of the extensive overview of the functioning of the EU’s mechanisms and of relevant case law it provides, the book is also highly relevant to academics and practitioners.